1900 January 1 Kelty Fife Fife Coal Co Ltd David Brown 58 Engineman On surface  miscellaneous Deceased, who was alone when the accident occurred, appeared to have been on the top of the cylinders of a vertical pumping engine, filling the lubricators, and to have fallen thence to the floor, a distance of about 13 feet. His skull was fractured. 1900 January 4 Auchlochan Lanark W C S Cunningham John Wyllie 39 Roadsman In shafts  falling from part way down Deceased was acting temporarily as bottomer in a shaft in which there were two landings, one of them being eight fathoms above the bottom. Only ten miners were employed in the Upper Seam, and one bottomer acted for both landings, riding from one to the other as required. Deceased was descending from the upper to the lower landing, and while closing the gate behind him at the former, appeared to have slipped between the end of the cage and the side of the shaft, and to have fallen to the bottom, the cage descending and resting upon him. He was extricated immediately, but died a minute or two afterwards. 1900 January 8 Niddrie Edinburgh Niddrie & Benhar Coal Co Ltd Robert Logan 47 Fireman Explosions of fire damp or coal dust Deceased and another fireman began to inspect the workings after the holiday, preparatory to work restarting. In going to a rise place by the usual ladder-way, they found it blocked by a fall, and returning, they proceeded up the brake incline, deceased leading the way; at the drum, gas was ignited by deceased's open light, which he carried on his cap, and an explosion resulted, causing him to lose his hold and fall to the bottom of incline, a distance of 40 yards. The gradient was 75°. Gas was known to be in the rise place some distance away, and both men carried safety lamps besides their open lights, but never before had gas been seen in a working brake incline. From Main body of report: At Niddrie Colliery the deceased and another fireman were examining the workings after the New Year's holidays, and although not perhaps expecting fire-damp, yet had with them a safety lamp which, however, they were not using at the time. Niddrie, although a deep mine, is yet very free from fire-damp. 1900 January 10 Merryton Lanark Merryton Coal Co David Thompson 15 Pony Driver Falls in Mines  Falls of Roof Deceased was in the act of hooking the chain from a pony on to a hutch close to the working face, when a large fall of roof took place, swinging out the timber which was set very close as the roof is soft. 1900 January 12 Glenyards (Fireclay) Stirling Glenyards Fireclay Co Samuel Connor 31 Miner Falls in Mines  Falls of Roof A fall of roof from the face of a thick fireclay seam. 1900 January 18 Rosebank Fife John Nimmo & Son Ltd Thomas Hynd 23 Brusher Falls in Mines  Falls of Roof Deceased was pulling down some loose stones left by a recently fired brushing shot, when a large stone fell upon him breaking his back. He succumbed to his injuries on 20th November. 1900 January 19 Clydesdale Lanark United Collieries Ltd Duncan Russell 55 Roadsman Miscellaneous underground  sundries While working in the pit deceased punctured his hand with a rusty nail, and blood poisoning supervened, causing his death 10 days later. 1900 January 19 Springbank Lanark Springbank Colliery Co Ltd Thomas Gill 35 machineman Falls in Mines  Falls of Roof Deceased was employed as advance rail layer for a coal cutting machine, and while engaged preparing to set a prop, the roof suddenly fell from between a "dry" and a "lype," which were unseen. 1900 January 24 Stanrigg Lanark Wm Black & Sons Ltd William Bulloch 56 Sinking Contractor Miscellaneous underground  suffocation by natural gases Deceased had taken a contract to re-open an old shaft filled with debris. It had been cleared out a few fathoms by a previous contractor. Deceased had not made a start with the work, but descended by means of a windlass and bucket to examine the pit, when he was overcome by black damp and fell from the bucket. 1900 January 24 Whitehill Edinburgh Lothian Coal Co Ltd James Thomson 49 Wagon repairer On surface  railways, sidings or tramways Deceased was engaged repairing the buffer of a wagon, when another, which had been shunted into the same road, moved slowly and silently forward, and he was fatally crushed between them. 1900 January 26 Hallside Lanark James Dunlop & Co Ltd Henry Cairns 38 Road Repairer Falls in Mines  Falls of Roof Fall of roof on road while repairing it. 1900 January 26 Stane Lanark Turners Ltd George Montgomery 57 Labourer On surface  railways, sidings or tramways Crushed between wagons at the screens. 1900 January 29 Gilbertfield No 2 Pit Lanark Cambuslang Coal Co Ltd Charles Sneddon 58 Miner Falls in Mines  Falls of Roof Fall of roof in working place. 1900 February 5 Eastrigg Linlithgow Eastrigg Coal Co Francis Bothwell 45 Brusher Miscellaneous underground  by explosives Deceased bored a hole for a shot to blast down the brushing, which was composed of very hard sandstone, and while inserting part of the charge of gelignite an explosion occurred. The cartridges were hard. 1900 February 12 Carbarns Lanark Wm Hudspith & Co James Dickson 27 Fireman Explosions of fire damp or coal dust A section of Ell Coal had been reached by a stone mine driven upwards from the Main Coal, and a place had been driven in the Ell Coal to a small blind-pit put up from the Main Coal on the vees of a trouble so as to provide two airways. While driving the stone mine and the place in the Ell Coal, a current of air was carried forward by brattice, but the current was so feeble that when driving in the Ell Coal it had to be assisted by means of a hand fan and wood rhones or air boxes. Some trouble had been experienced with fire damp in the Ell Coal. The connection with the blind pit had been completed before the accident, but notwithstanding this, on the day of the accident gas was found in the Ell Coal, and no miners were allowed to work in it. The three deceased, and another man, who was injured, were engaged trying to remove the gas. The injured man was working the hand fan and the fireman had gone forward with a Davy safety lamp to see if the connection with the blind pit was open, and the manager and oversman were near the foot of the stone mine, when a somewhat violent explosion occurred, coming from where the fireman was. The fireman's body was found near the blind pit, and the bottom of his safety lamp was found some yards further out. The gauze was not found. The place in the Ell Coal was dry and rather dusty. From Main body of report: The Carbarns Colliery explosion was primarily due to insufficient ventilation, the return air way was of inadequate size, and considerable leakage took place from the intake air current owing to defective stoppings, the consequence was that although there was an efficient fan and a good intake air road very little air reached the-face, and what, I believe, was a comparatively limited issue of fire-damp could not be properly dealt with. A connection made with a blind pit a day or two before the accident had been expected to remedy matters, but this did not increase the feeble current, and fire-damp was found in considerable quantities on the day of the explosion, and the deceased men were engaged in its removal at the time of the accident-an operation which, I think, should have been left over until the ordinary workmen were out of the pit. One of the deceased, the fireman, went forward to near the top of the blind pit and the explosion came from him. He carried an ordinary Davy safety lamp and after the accident the safety lamp, minus the gauze, was found a few yards further out than his body. The gauze was not found, but was supposed to be under a large fall of roof, which took place after the explosion, near where the lamp was found. 1900 February 13 Grangemouth Stirling Grangemouth Coal Co Ltd David Kerr Harrower 13 Stone Picker On surface  by machinery Crushed by the connecting rod of a pumping engine. 1900 February 14 Earnock Lanark John Watson Ltd Henry McCairtney 43 Miner Miscellaneous underground  by explosives A shot in deceased's place was lighted by the fireman. Deceased retired, but, apparently deceived either by the sound of another shot or by a bump in the strata, thought his shot had exploded, and returned to his place, and was fatally injured by his shot exploding. 1900 February 19 Gilmilnscroft No 3 Pit Ayr Gauchalland Coal Co Wm. McConnell 38 Miner Falls in Mines  Falls of Side Fall of coal while holing beneath it. Caused by the want of a sprag. 1900 February 22 Glespin Lanark Robert Swann Robert Weir 33 Manager Explosions of fire damp or coal dust Deceased, with his oversman and fireman, went to survey a part of the workings in the Four-Feet coal seam, all of them carrying open lights, when gas was ignited by one or other of deceased's or fireman's light, resulting in an explosion. Gas had not been seen in the section, but three years before it was found in a section opposite. The section was part of a "ventilating district," and in terms of section 5 of the Coal Mines Regulation Act, 1896, should have been inspected daily, but apparently this had not been done. In close proximity to the place of accident was a large fault. From Main body of report: At Glespin Colliery, where fire-damp is hardly ever seen, the manager and other officials were surveying some abandoned workings, when they encountered some gas. It would have been prudent in this case to have made an examination with a safety lamp before commencing the survey. 1900 February 22 Wester Queenslie Lanark John Allan James Broadley 45 Miner Miscellaneous underground  by explosives While forcing gelignite cartridges into a shot hole drilled in sandstone with a wooden stemmer they exploded. Another person was injured. 1900 February 23 Dumbreck No 2 Pit Stirling Wm Baird & Co Ltd Alexander Miller 41 Fireman Explosions of fire damp or coal dust While making his inspection previous to the night shift, and immediately after the fan had been restarted after a stoppage of 14 hours for repairs, an explosion of fire damp took place, wrecking the section of workings. His body was found 50 yards distant from the working place where his safety lamp and naked lamp were lying. He evidently was using his naked light. From Main body of report: No fewer than three firemen lost their lives while making their inspection, previous to the commencement of the shift, with a naked light instead of with a safety lamp. The first of these happened in Dumbreck No. 2 Pit. The fan had been stopped for 14 hours for repairs, and as soon as it was restarted the deceased fireman commenced to make an inspection of the workings with a naked light. It is almost incredible that a man should thus court death, but when his naked lamp was afterwards found lying beside his safety lamp the only conclusion one can arrive at is that while carrying an open light he walked into an accumulation of fire-damp, with the inevitable result that an explosion followed. 1900 February 23 Whistleberry No 2 Pit Lanark Archd Russell John McCluskey 40 Miner Falls in Mines  Falls of Roof Fall of roof at working place. 1900 March 2 Earnock Lanark John Watson Ltd Thomas Prentice 54 Ashman On surface  miscellaneous A wall against which dross for the boilers was laid down collapsed, and fell on deceased. 1900 March 5 Rosewell Edinburgh Lothian Coal Co Ltd Alexander Nisbet 31 Miner Falls in Mines  Falls of Roof Deceased was proceeding to the rise side of his working-place when the roof suddenly fell upon him. 1900 March 6 Jellieston No 2 Pit Ayr Dalmellington Iron Co Ltd James Paterson 75 Pony Driver Haulage  by trams and tubs He fell off a "race" of hutches on a horse road and was run over. 1900 March 9 Arniston Edinburgh Arniston Coal Co Ltd John Sweeney 37 Drawer Haulage  on inclined or engine planes Deceased was a drawer on a cuddiebrae, and while descending with a loaded tub the wheel-tree came out and tub and cuddie descended rapidly to the level road ; he held on to the tub, and when it struck the wall side the impact threw him back in front of the descending cuddle. The wheel-tree was too short and had been put up shortly before the accident. 1900 March 12 Pumpherston (Oil Shale) Linlithgow Pumpherston Oil Co Ltd Archibald Murphy 39 Miner Explosions of fire damp or coal dust Deceased worked in an upset in the Pattison shale, and on the morning of the accident the fireman discovered gas and prevented him starting, but sent him to work in a level above. After breakfast he went in to have a look at the upset face, and while going up his open light ignited the gas, causing an explosion, whereby he was severely burned, the injuries terminating in his death about three weeks afterwards. The deceased was well aware of the presence of gas, and in passing in he was warned by the boy who worked a hand fan at the foot of the upset. From Main body of report: In the Pumpherston Oil Shale Mine and Cowdenbeath Colliery explosions the presence of small quantities of fire-damp was known before the explosions, in the Pumpherston case the deceased man, against the order of the fireman, went into an upset and ignited gas. 1900 March 14 Cowdenbeath Fife Fife Coal Co Ltd Richard Lumsden 29 Locomotive Driver On surface  railways, sidings or tramways Deceased, who had had previous experience as a locomotive driver elsewhere, had only commenced work here on the morning of the accident, and was assisting the ordinary driver in order to ''learn the road." When taking a train of twenty-nine loaded trucks down from the pit on a gradient falling 1 in 33, the driver lost control of the train, and finding that his locomotive wheels were "skidding," and that he was unable to pull up, he shouted to deceased to jump off, at the same time doing so himself. Deceased remained on the engine, which left the rails at a set of facing points, toppled over, and fell upon the weighing table, which was broken to pieces. Deceased was thrown into the weighing pit and killed instantly. The whole of the brakes were said to have been pinned down, but apparently they had not sufficient power to control the train. 1900 March 26 Cowdenbeath Fife Fife Coal Co Ltd Michael Rowley 50 Miner Explosions of fire damp or coal dust Deceased and another worked in an upset near the face of a dook. The upset had been driven for a distance of about 20 feet, and had a rise of 1 in 2. Canvas was led to the mouth of the upset, but no provision was made to take air to the face. No one had worked in the upset for 40 hours prior to the accident. The fireman reported to deceased's fellow workman that he had found a small quantity of firedamp at the face of the upset, and had wafted it out, and permitted them to pass inbye, giving them an unlocked Davy lamp, with which they might examine the place if they entered it before he reached it again. On reaching the upset they entered it with open lights, and ignited some gas, which burned both men somewhat severely. Deceased succumbed to his injuries five days' later. 1900 March 30 Polton Edinburgh Lothian Coal Co Ltd Patrick Clark 21 Miner Falls in Mines  Falls of Roof Deceased was standing holing on top of the coal, when the roof suddenly fell. 1900 April 7 Arniston Edinburgh Arniston Coal Co Ltd David Jack 63 Cranefooter Falls in Mines  Falls of Side Deceased was assisting a fireman to rail a set of derailed tubs on a wheel brae, when a large stone fell from the side near the roof and rolled over him, causing injuries which terminated fatally an hour afterwards. 1900 April 11 Auchenharvie No 5 Pit Ayr Glengarnock Iron & Steel Co Ltd Wm. McIntyre 40 Miner Haulage  on inclined or engine planes Run over by runaway hutches on a self-acting incline when travelling up to his working place. 1900 April 11 Fallahill Linlithgow United Collieries Ltd James McLean 23 Miner Falls in Mines  Falls of Roof Deceased was working alone in a long wall place, in a thin seam, when a piece of sandstone, 7 ft. in length and of triangular section, fell upon him, fracturing his skull. One side of the stone was formed by a "dry," which only became visible after the accident. From Main body of report: Two miners, sons of the fireman, lost their lives, and other two miners were injured, in Holytown No. 12 Pit by an explosion evidently caused by gas from a sudden outburst coming in contact with a naked light. The Lower Drumgray seam was being opened up by the long-wall system of working, when a sudden break in the roof took place, and one of the miners, on rushing out to the road-head, ignited the gas. The fireman, on returning about half an hour afterwards, observed some of the timbering on fire about 40 yards distant from where the gas was ignited, and was fortunate in retiring to a place of safety ere there was a second explosion, caused by the gas accumulating and igniting at the burning timber. After this, the owners were induced to introduce safety lamps, but within six months they wished to revert to open lights, and seemed to consider it a hardship when I informed them that I would oppose any attempt to withdraw the safety lamps in the meantime. 1900 April 13 Glencraig Fife Wilsons & Clyde Coal Co Ltd Thomas Wood 53 Fireman Miscellaneous underground  by explosives A place was being driven up on a level road for ventilation, and a shot was prepared and fuse ignited by the miner in charge of the place: just then deceased passed in the level, and he went to the dip side opposite where place should come through to ascertain the thickness of coal between, when the shot exploded and blew through, killing him instantaneously. 1900 April 16 Bowhill Fife Bowhill Coal Co Ltd Cornelius O'Donnell 35 Stone Miner Miscellaneous underground  irruptions of water Deceased and another miner worked in a stone mine at foot of the main dook. and at the same time a "througher" was being driven toward the companion dook 35 yards away, which contained water: this water suddenly burst into "througher'' and running to the stone mine deceased was drowned. The thickness of coal between "througher" and companion dook at time of burst was 13 inches. The water lay 95 feet up the companion dook road, and the quantity calculated amounted to 29,500 gallons, with a head of 10.4 lbs. per square inch. A prosecution was raised against the manager for contravention of General Rule 13. 1900 April 21 Eddlewood Lanark John Watson Ltd William Murphy 50 Brusher Falls in Mines  Falls of Side Deceased was alone putting in a building, when a stone fell off the face of the brushing on him. Before he was discovered he had lain under the stone for fully an hour, he subsequently died from his injuries. 1900 April 23 Cowdenbeath Fife Fife Coal Co Ltd James McCue 32 Roadsman Falls in Mines  Falls of Roof Deceased and another workman were engaged taking a tub along an airway, from which the rails had been lifted, and while dragging it down it struck a prop, and knocking it out, released a stone, which fell and fatally crushed him. 1900 May 1 Cowdenbeath Fife Fife Coal Co Ltd Thomas Glenny 14 Drawer Falls in Mines  Falls of Roof The deceased were found under a stone, 30 ft. from the coal face, by the fireman while making his usual inspection; the boy was quite dead, and the man died four hours later from his injuries. It is supposed that Glenny came inbye with an empty tub, and leaving it at the place of "coup," he went to the face for Brown to assist him to "coup" it up, and both were returning for that purpose when the roof fell. 1900 May 2 Blantyre Ferme Lanark A G Moore & Co Wm. Renfrew 29 Miner Falls in Mines  Falls of Side Fall of coal and midstone, which burst away from the unholed face. 1900 May 2 Meiklehill No 5 Pit Dumbarton James Wood Ltd James Kerr 20 Drawer Haulage  by trams and tubs Apparently he was illegally drawing in front of a loaded hutch coming down an inclined road, and got run over by it. 1900 May 5 Prestongrange Haddington Summerlee and Mossend Iron and Steel Co Ltd Francis Dawson 21 Brusher Falls in Mines  Falls of Roof Deceased and three others were brushing a level in a 3 ft. 6 in. seam, which was being opened up to work long wall. He knocked out a prop at the mouth of a branch road in order to get down some stones wherewith to complete a roadside building, when a heavy fall took place, part of which slipped forward and struck him, knocking him down and killing him instantly. 1900 May 17 Charlestown (Limestone) Fife Charlestown Lime Co John Watson 62 Labourer Metalliferous mines Deceased was engaged filling a tub near the face when a stone fell from the roof and struck him. 1900 May 18 Parkhead No 17 Pit Lanark Glasgow Iron & Steel Co Ltd John McCrae 54 Miner Falls in Mines  Falls of Side Fall of coal, which he knew to be loose, but which he failed to sprag. 1900 May 21 Arniston Edinburgh Arniston Coal Co Ltd William Brodie 35 Miner Falls in Mines  Falls of Side A strip of about 3 ft. in width was being taken off one side of an old longwall road, for the purpose of straightening it. Deceased was holing out the old stowage under the overhanging side, when a stone 9 ft. in length by 3 ft. by 3 ft. at extremes, suddenly came away from an old break formed by the subsidence of the roof over the longwall waste, and fell upon him. He died whilst being extricated. The stone did not appear to have been in any way shored or ranced up. 1900 June 2 Cameron Fife Bowman & Co John Grey 17 Drawer Falls in Mines  Falls of Side While passing along the coal face, a mass of coal, which was holed and ranced, broke over the rances and killed him. 1900 June 6 Boghead Linlithgow Gavin Paul & Sons James Doyle 46 Miner Falls in Mines  Falls of Roof A thin stone fell right across deceased's place from the roof. 1900 June 7 Portland No 8 Pit Ayr Wm Baird & Co Ltd Wm. McGaw 45 Labourer On surface  by machinery When working beneath a "shaking scree" the hangers supporting it gave way, and it fell on him. 1900 June 8 Glenesk Edinburgh Melville Coal Co Ltd William Grey 50 Joiner In shafts  falling from part way down While deceased and others were working in a sinking shaft, a plank on which they stood broke, and they fell on to a scaffold below. 1900 June 12 Cadzow Lanark Cadzow Coal Co Ltd George William Renwick 16 Carter On surface  miscellaneous While driving a cart in the colliery yard the wheel came in contact with a pump-pipe, and the cart was overturned. 1900 June 14 Cadzow Lanark Cadzow Coal Co Ltd William Cornish 17 Bogieman Haulage  on inclined or engine planes Deceased was discovered by another bogieman, who was proceeding inbye with an empty rake, under the tubs of his own rake. It is supposed that deceased, who had lifted a part of his loaded rake from a bench a short distance inbye from place of accident, had failed to grip his rope, and the rake descending a slight dip, ran too hard, and he attempted to jump off at a man-hole, but striking the stoop side he was thrown back among the moving tubs. 1900 June 18 Blair No 7 Pit Ayr Wm Baird & Co Ltd Alexr. Clockworthy 18 Miner Falls in Mines  Falls of Roof Fall of roof at working place. 1900 July 2 Whitrigg Linlithgow R Forrester & Co George McCallum 33 Drawer In shafts  whilst ascending or descending by machinery Deceased was one of six men who worked on the night shift in a seam which was only being opened up. and in which no bottomer was employed. Having occasion to ascend the shaft, he rang the signal bell from the pit bottom. A witness near the pit bottom stated that the bell was rung three times, but he failed to observe whether any return signal was given. The engineman and three others on pithead stated that the bell only rang once. As the cage was being raised from pit bottom, in which it was standing at the time, deceased attempted to jump on. and was apparently caught and crushed against the door head, or side of the shaft. He was dragged up for some distance, and then fell back to the bottom. His heart and lungs had been crushed, and he had received a severe scalp wound. 1900 July 4 Niddrie Edinburgh Niddrie & Benhar Coal Co Ltd James Heriot 55 Miner Falls in Mines  Falls of Side Deceased was engaged breaking out his "cut," when the coal suddenly burst over the sprags. The injuries proved fatal about eight weeks afterwards. 1900 July 5 Deans Linlithgow Pumpherston Oil Co Ltd Alexander Begbie 32 Pitheadman In shafts  falling into shaft from surface Some water was being drawn from the bottom of a pit sinking to the Houston Coal, in a barrel attached to the winding rope. As the barrel was raised from the bottom, its lip caught the lower edge of the barring, jerking the rope and causing it to oscillate somewhat violently in the shaft. Deceased, who was standing at the striking scaffold at pithead, put out his hand to steady the rope, but missed it, overbalanced, and fell to the bottom of the shaft, 108 feet below, striking the barrel in his descent. His skull was fractured. 1900 July 7 Lumphinnans Fife Fife Coal Co Ltd Adam Drylie 44 Contractor Brusher Falls in Mines  Falls of Side Deceased had fired a shot in the brushing which had not cleared away the stone at one side, and he was examining the stone preparatory to boring a hole to blast it down when it fell on him. 1900 July 18 Skerrington No 20 Pit Ayr J & R Howie Alexr. Goldie 40 Miner Miscellaneous underground  by explosives He was firing a gunpowder shot, and either prematurely lit the gunpowder in the squib, or was returning to re-light the squib, thinking that it had gone out, when the shot went off. 1900 July 24 Kelty Fife Fife Coal Co Ltd Thomas Paterson 27 Labourer In shafts  ropes or chains breaking Deceased's duty was to place empty hutches on the cages at the surface. A balance rope below the cages is in use. As one of the cages containing empty hutches was leaving the surface some empty hutches were being placed in position for putting on the same cage in its next descent. These hutches ran too far, and deceased attempted to hold them back by placing his back against them, but was overcome and forced into the descending cage, followed by one of the hutches, which jammed the cage and prevented its descent. The engineman had put on full steam to raise the loaded cage from the bottom, and the strain was communicated by the balance rope to the bottom of the cage at the surface, and it was pulled down, overcoming the resistance offered by the hutch, and eventually fell with a jerk, breaking the chain next the rope, and the cage and deceased fell to the bottom. From Main body of report: An accident at Kelty Colliery was indirectly caused by the use of a balance rope, and to avoid a similar accident the timbers below which the balance rope extends were, after the accident arranged so that they would give way on a slight strain being applied. 1900 August 2 Blantyre Ferme Lanark A G Moore & Co John Henderson 32 overman Haulage  by ropes or chains breaking While travelling up a "dook" behind a nice of hutches a coupling broke and the hutches ran back on him. 1900 August 6 Allanton Lanark William Barr & Sons James Smith 19 brakesman On surface  railways, sidings or tramways Deceased was running alongside some wagons to regulate their speed by the brake of the first one as they passed into a siding, when by some means he stumbled and fell, one of the wagons passing over him. The brake on the wagon by which the speed was being regulated was a patent one. 1900 August 10 Bardykes No 1 Pit Lanark Merry & Cunninghame Ltd Robert Watson 45 Miner Falls in Mines  Falls of Roof Fall of roof at working place. 1900 August 14 Devon Clackmannan Alloa Coal Co John Mitchell 65 Repairer Haulage  on inclined or engine planes While a bogieman was riding in front of a set of loaded tubs on an engine dook 1,100 yards in length, he observed deceased standing on the right side of the road. Immediately after passing him he heard a cry, and at once jumped off the bogie and signalled to stop the set. His lamp having been extinguished, he went down the dook for a short distance to get a light, and on returning found deceased on the left side of dook about 10 yards above the point where he had passed him, and in the act of crawling from between the fourth and fifth tubs of the set. Deceased stated that while the set was passing him his foot slipped, and he fell against the electric signal wires, receiving a shock which caused him to recoil and fall between the tubs. From the relative positions of deceased, some pump pipes, a wire rope,and the signal wires, it appeared to be much more probable that he had been attempting to get upon the tubs or the couplings between them in order to ride up the dook, a practice which, although forbidden by the Special Rules, was evidently somewhat prevalent in the mine at the time. Deceased succumbed to his injuries nine days afterwards. 1900 August 17 Cadder No 17 Pit Lanark Carron Co Hugh Harrigan 47 Miner Haulage  on inclined or engine planes While going up a self-acting incline he was run over by a runaway hutch. 1900 August 17 Portland No 5 Pit Ayr Portland Colliery Co Ltd John Todd, jun 34 Oncost Worker Explosions of fire damp or coal dust A section of dip workings sealed off by a brick stopping was being re-opened. Two shots of Nobel's blasting gelatine were fired in the stopping, 30 inches thick, blowing it down and causing an explosion of fire damp accumulated behind it. The men all retired nearer the shaft, and an hour afterwards a second explosion occurred, fatally injuring six of them and injuring other two. The cause of the second explosion has not been ascertained. From Main body of report: The most serious explosion that happened during the year occurred in No. 5 Pit, Portland Colliery, Ayrshire. This colliery, which is close to Kilmarnock, belongs to the Portland Colliery Co., Ltd., Mr. Allan Gilmour being the managing-director, and Mr. Daniel Gilmour the manager. No. 5 or Nursery Pit is the downcast shaft, No. 4 or Wellington Pit, which is 1,100 yards distant, being the upcast. The main coal seam in which the explosion happened is 7 feet thick, and is worked on the "stoop and room" system. The accompanying plan No. 1, shows the Hurlford section of the workings. Owing to a fire caused by spontaneous combustion some years ago the section BB was shut off by building a stopping in each of the two mines which formed the only means of access to this section. One of these stoppings was in the Dook Mine at the point (d). It appears that about a month previous to the explosion these old workings were tapped at the point (f) when fire-damp was given off. Thereafter a working place was driven as far as the point (e) where John Higgins, Junr., and Boyd Cummock were working with safety lamps, their place being ventilated by means of bratticing. It having been determined to open up the section BB from the Dook Mine also, on the 17th August, David Clark and John Todd were sent by the under-manager to blast out the stopping (d) by means of Nobel's blasting gelatine. This stopping consisted of a brick wall, 30 inches thick, built with cement. It seems that about 12.30 p.m., after having drilled and charged two shot-holes in the stopping, and lit the fuses, the men retired to a point between (c) and (h). First one and then the other shot went off, and the second was instantly followed by an explosion of fire-damp, which injured Alexr. Dunlop, who was working with James Brown at the point (a). There were 12 men in all in the section, and after the explosion they at once retired up the "Crosscut Dook." 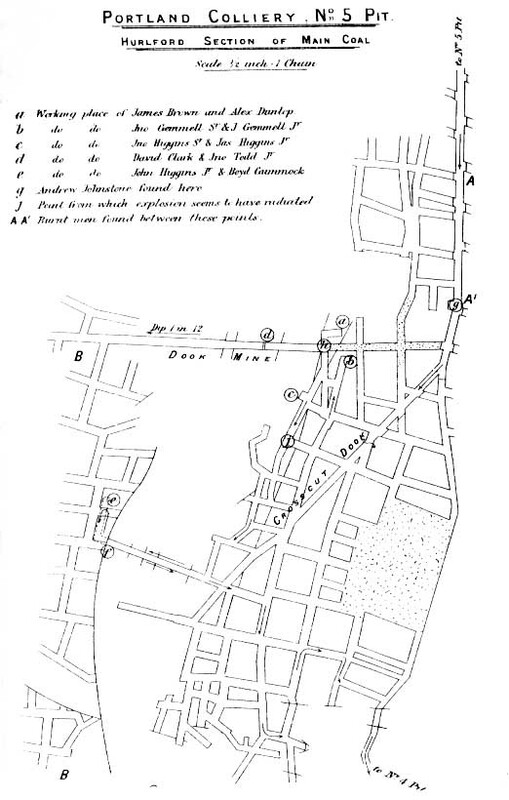 Four men went out to the pit bottom, while the others remained in the intake airway between the points AA', and while waiting there until the arrival of the under-manager the fireman and two of the miners took the safety lamps and went back to attempt to get their clothes, but encountered fire-damp when approaching the place (b), and had to retire. When Johnstone, the under-manager, arrived, he and the fireman and two miners went down the Crosscut Dook to explore, and having been met by fire-damp, which put out one of the two safety lamps, they had retired nearly to the top of the dook when a second explosion happened. About three-quarters of an hour afterwards the men were all found insensible by the manager and others between the points A and A1, the point A being some 260 yards distant from No. 5 shaft. The under-manager was found lying in the recess (g) with a safety lamp and his naked lamp beside him. The other safety lamp was found some distance nearer the pit bottom. Turnbull's (the fireman) safety lamp was afterwards found at the point (h), where he appears to have been at the time of the first explosion. The ventilating current comes from No. 5 Pit and down the Crosscut Dook in the direction indicated by the arrows, and was said to have been conducted by screens and bratticing to within 20 yards of the stopping (d), but as these erections were all blown away by the explosion a subsequent inspection could not show where they had been placed. On examining the stopping (d) after the explosion, it was found that the shots had made an opening 4 feet wide by 2 2/3 feet high right through. There seems to be no doubt that the first explosion was caused by the shots igniting firedamp accumulated on the lower side of the stopping. About an hour elapsed ere the second explosion occurred, but I have been unable to ascertain what was the cause of it. It seems evident that a body of firedamp accumulated behind the stopping, on being released by the shots, worked its way upwards until it came in contact with a naked light, and the explosion thus initiated was carried on and intensified by the coal dust, as these workings are both dry and dusty. There is evidence that the force of the blast radiated from the vicinity of the point (j), and this points to the possibility of the first explosion having set fire to some timbering or brattice cloth which kept burning until the body of firedamp reached it and became ignited. The investigation and subsequent inquiry into the cause of this explosion brought to light several contraventions of the regulations, and proceedings were taken against the manager as being responsible for three of these. After evidence was heard he was convicted in each case and fined £15. 1900 August 30 Gilmilnscroft No 3 Pit Ayr Gauchalland Coal Co David Mitchell 19 Miner Shaft accidents -things falling from part way down When about to draw an empty hutch off the cage he was struck on the head by a stone which fell down the shaft from some place unknown. The second of these explosions happened in Kenmuirhill Colliery, and in this same colliery another fireman was injured five months previously while inspecting with a naked light. 1900 September 5 Cornsilloch Lanark Archibald Russell Richard Farrell 20 Chain Runner Haulage  on inclined or engine planes Deceased was employed as chain-runner at an inside haulage and had finished his shift and was on his way to the pit bottom. A rake of hutches drawn by engine power overtook him, and he got on to it and was crushed between the top of a water chest, which was on the rake, and the timber supporting the roof. 1900 September 5 Newmains Lanark Coltness Iron Co Ltd James Murray 24 Brusher Falls in Mines  Falls of Roof Deceased and his father were engaged repairing a drawing road when a stone fell from the roof and crushed his neck against the end of an empty tub. Before he could be extricated he was suffocated. 1900 September 10 Boglesole No 4 Pit Lanark James Dunlop & Co Ltd Thos. Boyce 13 Stone Picker On surface  on railways, sidings or tramways While climbing upon a waggon to get a ride home the locomotive started, and the jerk causing him to fall he was run over by the waggon wheels. 1900 September 10 Kirkhill Lanark Kirkhill Colliery Co Robert McKenzie 60 Miner Falls in Mines  Falls of Roof Fall of roof in working place. 1900 September 11 Allanton Lanark William Barr & Sons Michael Hailly 30 Wagon Trimmer On surface  railways, sidings or tramways While pinching forward an empty wagon he was crushed between it and one of two other wagons on the same line of rails which he had left behind him insufficiently secured. 1900 September 11 Neilston No 3 Mine Stirling James Wood Ltd Wm. Barrons 44 Miner Falls in Mines  Falls of Roof Fall of roof at working place. The stone fell from between a lipe and a fault. 1900 September 12 Dalquharron-Drummochreen Mine Ayr John Campbell Kennedy Alexr. Haggerty 28 Drawer Falls in Mines  Falls of Roof Fall of roof in working place. 1900 September 12 East Parkhead No 1 Pit Lanark Wilsons & Clyde Coal Co Ltd Peter Duncan 62 Miner Shaft accidents  whilst ascending or descending by machinery While descending the shaft, the engineman lost control of his engine, and the cage forcibly landed at the bottom. Injured on 12th September 1899, and died on 20th April 1900. Other 7 men were injured. 1900 September 13 Castlecary (Fireclay mine) Dumbarton Castlecary Fireclay Co Ltd Michael Gribbon 29 Miner Miscellaneous underground  by explosives He lit the patent squib of a gunpowder shot, which appears to have gone off before he had time to escape. 1900 September 13 Tannochside No 2 Pit Lanark Archd Russell James Patrick 25 Miner Miscellaneous underground  by explosives A blind pit was being put up from a lower seam to his working place. He was warned to retire while a shot of gelignite was about to be fired in the blind pit, but he returned before it went off. The shot blew through the intervening strata and struck him. 1900 September 18 Drumsmudden No 2 Pit Ayr Dalmellington Iron Co Ltd James Ramage 61 Shaft repairer Shaft accidents - falling from part way down While standing on a scaffold in the upcast shaft it gave way, and he fell to the bottom, 17 fathoms below. 1900 September 25 Newbattle Edinburgh Lothian Coal Co Ltd Thomas Paxton 24 Dookfooter Haulage  on inclined or engine planes A rake of empty tubs descending the dook left the rails, and those in front up-ended against the roof. When the rake was drawn up the front tub uncoupled and, falling into position on the rails, descended the dook at a high speed, and at a bench 80 yards down it crashed into some tubs there, on one of which deceased sat, and fatally injured him. 1900 September 27 Springbank Lanark Springbank Colliery Co Ltd William John Hunter 23 Brusher Falls in Mines  Falls of Roof Deceased was engaged putting a building in the rise side of a wall, and left to go to the roadhead for oil to replenish his lamp, and just as he reached the roadhead the roof fell upon him. .. The third happened in Hattonrigg Colliery in a stone mine, rising 1 in 3, and in which the splint coal had just been reached. By an accident to the rhones used for conveying the ventilating current to the face of the mine the air had been cut off for 36 hours, and although the fireman could not fail to be aware of this, he went in with a naked light, and in consequence of his folly lost his life. 1900 October 9 Overwood (Sandstone) Lanark Baird & Stevenson George Whitelaw 69 Watchman Metalliferous mines Deceased appears to have been refilling a naphtha lamp from a barrel while the lamp was burning, and an ignition of naphtha took place, burning him about the legs. He died 13 days afterwards. 1900 October 12 Muiravonside Stirling James Nimmo & Co Ltd Malcolm Baxter 35 Miner Falls in Mines  Falls of Roof Deceased had just commenced to hole when the roof suddenly fell and crushed him beneath it. The "vees" of a small hitch had been exposed prior to the fall, and stone came away from it and a face break. 1900 October 24 Tannochside No 3 Pit Lanark Archd Russell Joseph Clow 19 Miner Falls in Mines  Falls of Roof Fall of roof from brushing face. 1900 October 30 Lochgelly Fife Lochgelly Iron & Coal Co Ltd John Adamson 50 Miner Falls in Mines  Falls of Side The seam lies at an angle of 45°, and to prevent the coal when worked off the face falling into the waste "batteries," consisting of props built against upright supports to roof, are erected. Deceased was engaged at this work when a piece of coal suddenly broke off the face over a sprag, and crushed him against the "battery." He subsequently died from the effects of his injuries. 1900 November 10 Kingseat Fife Wallace Brothers Alex. Ferguson 49 Blacksmith In shafts  whilst ascending or descending by machinery Deceased descended the shaft to the lower bottom and put shoes on some horses, and afterwards he and a roadsman came to the mid-working, 53 fathoms above, and also shod horses there. After an interval they came back to the shaft to be raised. The usual signal was given, and the roadsman stepped on to the cage, and deceased followed and shut the gate behind. When on the cage the roadsman asked if the gate was shut, to which deceased replied ''Almost," and the cage was raised; the roadsman heard a slight noise, and on turning round saw deceased disappear down the shaft. From the marks it was evident that deceased was caught at the door heads and carried up a distance of 10 ft., and there forced over a "bunten " at end of the shaft. It is probable deceased had put his head outside the cage to see if the gate was properly shut when he was caught. 1900 November 23 Bothwell Park No 2 Pit Lanark Wm Baird & Co Ltd John Leonard 24 Miner Haulage  by trams and tubs While travelling along a horse road he was crushed between the side and a "race" of hutches which he met. 1900 November 24 Gilmilnscroft No 4 Pit Ayr Gauchalland Coal Co James McEwan 14 Drawer Explosions of fire damp or coal dust He entered a road adjoining his working place, and on climbing over a fall his naked light ignited fire damp. The fireman stated that he had been redding the fall a short time before the explosion. The deceased ought not to have gone into the road. 1900 December 3 Stonelaw No 1 Pit Lanark Farme Coal Co Ltd Wm. Dunsmore 25 Bottomer Shaft accidents - falling from part way down He pushed a full hutch into the open shaft at a mid-working in a blind pit, and fell after it to the bottom. The cage was at the pit bottom, and he evidently thought it had been raised to the mid-working. 1900 December 5 Glencraig Fife Wilsons & Clyde Coal Co Ltd John Muir 22 Drawer Falls in Mines  Falls of Roof Deceased was proceeding outbye behind a loaded tub, and when about 35 ft. from the face the roof suddenly fell and completely buried him. The roof in falling carried the props and crowns with it. 1900 December 6 Benarty Fife Fife Coal Co Ltd Robert Harrower 40 Drawing contractor Haulage  by ropes or chains breaking Deceased emerged from a bench to shift the points on the main dook road as the rake left to ascend to the top, and a coupling breaking, four tubs ran back on him and he was crushed internally; his injuries proved fatal three days afterwards. The coupling was made of iron, and the broken link appeared to be defective. 1900 December 6 Cadder No 17 Pit Lanark Carron Co John Connelly 22 reddsman Haulage  on inclined or engine planes While turning a loaded hutch on the plates on a self-acting incline before clamping it to the rope, the hutch, owing to the block not being in position, got over the brow of the incline, carrying him in front of it. 1900 December 7 Sanquhar Colliery, Gateside Pit Dumfries J I McConnel Thomas Stewart 29 Brusher Falls in Mines  Falls of Roof Fall of roof on horse road while engaged in brushing it. 1900 December 13 Birkrigg Lanark Darngavil Coal Co Ltd Thomas McAllister 29 Labourer In shafts  falling into shaft from surface Deceased's duty was to take hutches loaded with ashes from the boiler fires and place them on one of the cages running in the shaft at the surface level, in order that they might be raised to the level of pithead, where they were taken off the cage and emptied over the dirt bing. He either was under the impression that the cage was at the required point at surface level when this was not the case, or while placing a hutch to be ready allowed it to go too far ; at any rate, he fell into the shaft with a hutch. 1900 December 13 Monkland No 8 Pit Lanark James Dunlop & Co Ltd George Mitchell 35 Brusher Miscellaneous underground  by explosives While carrying compressed gunpowder in his hand a spark from his naked light, illegally carried on his cap, caused it to explode. 1900 December 20 Cadder No 15 Pit (Ironstone Mine) Lanark Carron Co George Wedlock 32 Drawer Haulage  by trams and tubs Struck by a rail lying in an empty hutch in a horse lye, the outgoing race of full hutches having caught the empty hutches owing to the lines of rails being too close to each other. 1900 December 26 Lumphinnans Fife Fife Coal Co Ltd Andrew Graham 30 Shaftman In shafts  miscellaneous By a mistake on the part of the bottomer signalling before the tubs were properly fixed, the cage was raised and firmly held at the door-heads 12 ft. up. Deceased and two other workmen were sent to release it ; a "slide" was cut and the guides of the cage wore loosened, and he and one of the others went under the cage to ease it, when it slipped away suddenly on to cage seat and he was fatally crushed beneath it: the other man escaped injury. The rope did not appear to be taut. Only one cage was in use. The engineman stated the brake was not sufficiently powerful to keep the loaded cage in position when near the pit bottom. 1900 December 27 Rosehall No 12 Pit Lanark R Addie & Sons Collieries Ltd Luke Martin 70 Labourer On surface  miscellaneous A dross hopper in front of the boilers collapsed and fell upon him. 1900 December 27 Seafield (Oil shale) Linlithgow Pumpherston Oil Co Ltd John Sanderson 25 Miner Miscellaneous underground  by explosives Deceased had lighted a holing shot with white taped fuse which had evidently hung fire. He appeared to have returned to the place within 30 minutes, and to have been within three feet of the shot, when it exploded, killing him instantly. 1900 December 28 Ross Lanark Thomas Barr's Trustees William Murphy 56 Fireman Explosions of fire damp or coal dust Deceased was making his second visit of inspection, as usual with an open light, when he ignited some gas and caused an explosion. He examined the same place six hours before with a safety lamp, and found all clear; in the interval, the roof had broken up to the Pyotshaw coal, and gas was liberated. Gas was seen at the heading face, some distance above the place of ignition, eight days before, during a storm, when the barometer was exceptionally low. From Main body of report: At Ross Colliery a fireman had made his first inspection with a safety lamp and found all clear, and was proceeding with his second inspection using a naked light, when some gas which appears to have collected in the interval was ignited by his open light. 1900 December 29 Bent Lanark Bent Colliery Co Ltd James Muir 22 haulageman On surface  railways, sidings or tramways Deceased coupled together two wagons while they were moving, and in coming from between them appears to have stumbled, and was run over.